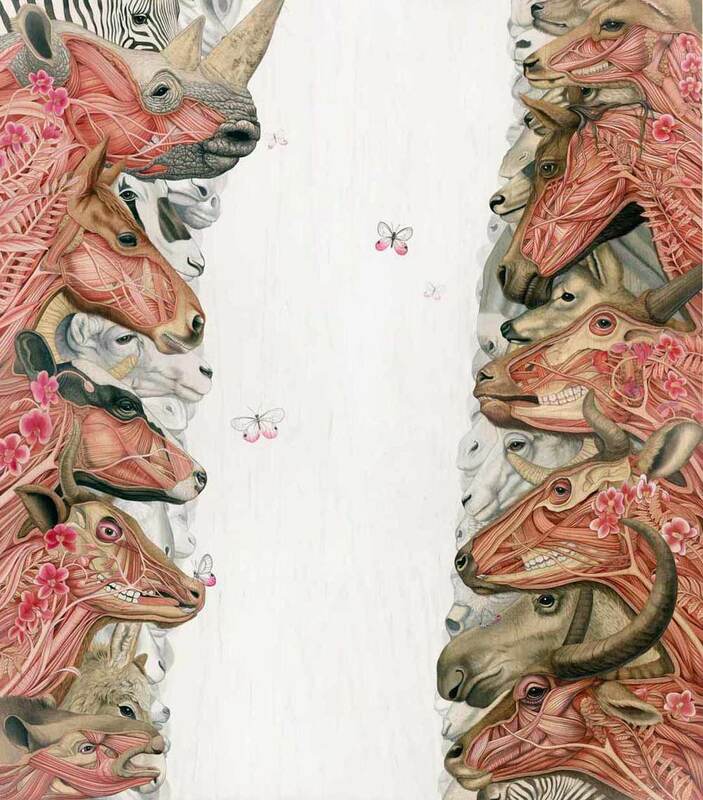 Tiffany Bozic is a self-taught artist currently living and working in San Francisco, California. Bozic has spent the majority of her life living with and observing the intricacies of nature. Her work has the traditional air of tightly rendered illustrations with a highly emotional range of surreal metaphorical themes. In her paintings and sketches she presents her vision of life’s struggles and triumphs that are largely autobiographical. Her wide array of subjects are inspired both from her extensive travels to wild places, and the research specimens at the California Academy of Sciences in San Francisco, California. Over the years, Bozic has developed a complex process of masking and staining the maple panels in which she paints on. By doing this, the natural grain can collaborate with each composition using multiple layers of watered down acrylic paint. She has participated in numerous group shows nationwide. Bozic has spoken at international events such as the 2007 Semi Permanent International Arts and Design Conference in Sydney, Australia. Bozic was also the first Artist in Residency at the California Academy of Sciences whereby she created the “From the Depths” exhibit on the public floor of the museum in November of 2007.